Well, I guess it's about that time...time to get moving on those Christmas cards. This is the first one I've done this year and I used this week's Mojo Monday sketch for inspiration. It came together quickly, which I was thankful for since I am, as always, super busy and on the go these days. I could definitely see myself using this sketch for more holiday cards. 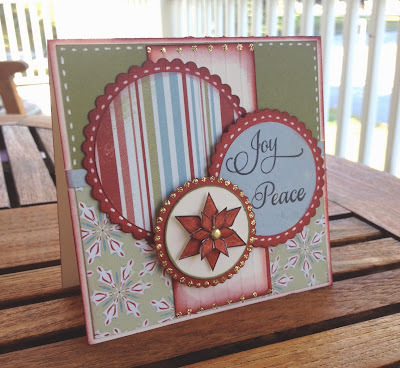 I used Verve Stamps "Bright Spirits" for my card and patterned papers from My Mind's Eye 6x6 "Merry Days of Christmas" paper pad. I sponged the edges of the center strip and scalloped circles with Aged Mahogany and Fired Brick Distress inks. Finally, some faux white stitching and gold stickles for accents finished this holiday card.